Let me introduce myself! My name is Dr. Chris Dirth, I was born and raised in Washington and, other than my time in chiropractic school, I have pretty much lived here my whole life. Before I became a chiropractor I was in the Navy for eight years, stationed on Whidbey Island. I met my wife while she was going to Western Washington University and soon after she graduated we moved to Mount Vernon and she started working at Vital Chiropractic as their officer manager/chiropractic assistant/baby wrangler. I became a patient at Vital Chiropractic and now I’ve returned as their newest doctor. While in school I became passionate about three things, pregnancy, babies, and nutrition. And most importantly how can I incorporate chiropractic care and nutrition to best support new momma through her pregnancy and then, once baby is born, how I can also continue to support the health and development of the new baby. As chiropractors we are the only ones trained to detect and correct subluxations. What the heck is a subluxation? A chiropractic subluxation is a self-perpetuating, central segmental motor control problem that involves a joint, such as a vertebral motion segment, that is not moving appropriately, resulting in ongoing maladaptive neural plastic changes that interfere with the central nervous system’s ability to self-regulate, self-organize, adapt, repair and heal. These problems may not show up immediately, they may show up 10 or more years later, but they will show up and if not detected and corrected before they become a problem they can go on cause debilitating problems. We learned that three things cause subluxations. Thoughts, traumas, and toxins. I haven’t met anyone that has been affected by just one of those things. I can’t say that all three affect 100% of people but it’s pretty close. Most people come to the chiropractor because of the trauma. A car accident, work accident, falling while skiing, hit their head, etc… Chiropractic is great for those things and in many cases much more effective than medications but what about the other two components of a subluxation? When most people think about toxins they are thinking poisons but it’s much more in our face than that, literally! The foods we eat can be toxic especially if we’re not eating organic foods. But even organic when consuming too much of one thing, it can become be toxic to our bodies. I am a self-proclaimed cheese fanatic, saying that I love cheese might be an understatement but too much cheese is toxic. There is a protein in dairy called casein. Casein gets bro ken down in our stomachs to form a chemical called casomorphine. This chemical acts in the exact same way as opioids do and increases activation of the pleasure center in our brain and we become addicted. So cheese is addicting! I can get adjusted every day but that is not going to help with the toxin I am putting in to my body. The Standard American Diet (SAD, pun intended) is not working for us. We are seeing more chronic diseases like diabetes, autoimmune disease, cancers, and allergies just to name a few. One third of the population is obese and about half is considered overweight. Are these people probably subluxated? Absolutely. And if they don’t change what they are putting into their body, they are going to stay subluxated. Our goal as chiropractors is to help your body recover from a state of dis-ease to a state of wellness. As much as we love seeing you and talking to you, we don’t want to see you 2-3 times a week for the rest of your life because that means we aren’t doing our job. That was a lot of information! Health is a complex issue and every single person is different, there is no one-size fits all answer. I am excited to be at Vital Chiropractic and I am excited to be working in this community with the awesome people that live and work here. 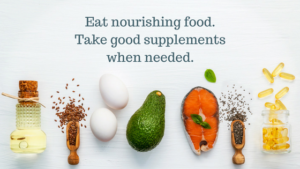 I am bringing my training in nutrition to the office and am more than happy to sit down and talk with you about any nutrition goals or concerns that you might have and together we can develop a path towards your health and wellness. Give us a call, contact us on Facebook, or stop by, we are more than happy to help you! 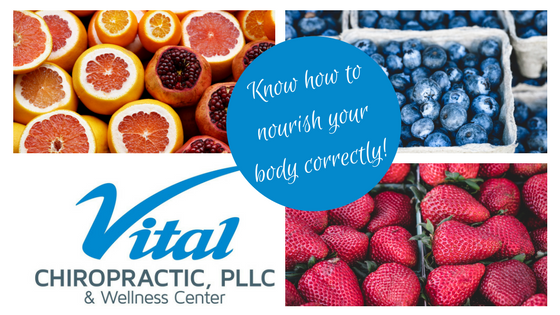 You can now contact our office for a nutritional consult with Dr. Chris Dirth! This is a new service we are offering in our office to compliment your care and another excellent service to help you reach your greatest potential! He can assess your current situation and give you a plan to make sure you are keeping your toxin load low and optimize your nutrition through what you eat and proper, quality, supplementation. He knows his nutrition!